Touchscreen can tap into computer systems with his mind. He can also emit electrical blasts from his hands. Additionally he is an espionage expert. Touchscreen is a super-villain on Super Earth One and one of the key members of the Villainous Army of Shadows. After the Hyper-Human War that wiped out all humans on the planet, CodeName Zero began a campaign to lead the world into darkness. But Michael Xander Hope aka Captain Infinity, and the Infinity Force have stood in his way, and thus the War for Eternity has become the major conflict of Super Earth One. It has been a war of attrition and for a long time the sides have struggled against one another while continuing to recruit other hypers to their respective sides. The Infinity Fortress had become a refuge and base of operations for all hypers who chose to follow The Light, so it was only a matter of time before it become CodeName Zero’s primary target. Army of Shadows lieutenant Arrowhead launched an attack against the Infinity Fortress, but was thwarted by Captain Infinity, Centuria and others. During the fight however Captain Infinity and Centuria got into a huge argument and not long after, Arrowhead made her an offer from CodeName Zero in which the two of them could team up to overthrow Captain Infinity and then rule Super Earth One together. Centuria thought about the offer, then decided to take it! The first step to bringing Captain Infinity down was to hack the Infinity Mainframe and shut it down. It was a complicated computer system that drew power from The Source, a powerful orb at the center of the planet that provided light to the world and energy to most heroic hypers, and the only member of the Army of Shadows that could break it was the technokinetic villain Touchscreen. Centuria met Touchscreen outside the fortress and brought him inside. They then made their way to the Mainframe, but they were confronted by Autumn Violet! The nature girl attempted to take them down, but the combined power of Centuria’s Infinity Rings and Touchscreen’s electrical energy blasts were too much for her to handle. They defeated her and moments later arrived at the Mainframe Computer. Touchscreen Immediately went to work. Captain Infinity meanwhile met with Crosscheck, Miranda Miracle and the speedster Sapphire Bolt. He briefed them on the attack from Arrowhead and began to strategize their next move. However before the meeting could get too far, CodeName Zero appeared and attacked, as Centuria had let him into the Fortress as well. 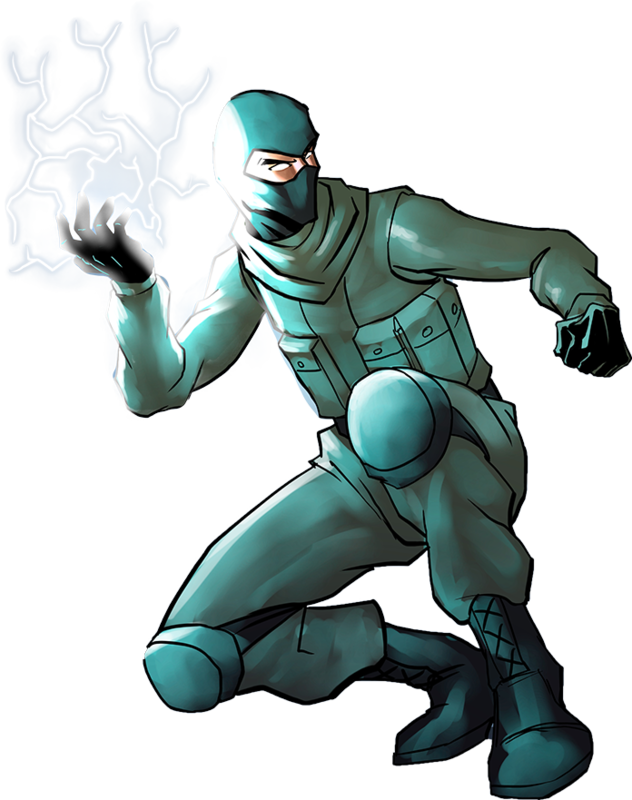 The surprise attack caught the heroes off guard and he was easily able to take Sapphire Bolt, Miranda Miracle and Crosscheck down with a blast of his zero-energy. Captain Infinity tried to engage him, but Zero wrapped the other three heroes in force-fields and threatened to crush them if he made a move. He then explained that he would let them go if Captain Infinity gave up the Infinity Fortress to him. Of course, the Captain refused. But that didn’t phase the villain who then explained that Touchscreen was already hacking the Mainframe computer, and that once the hack was complete the Infinity Fortress would be drained of The Light. CodeName Zero then vanished! With the villain gone the force-fields dissipated, and the heroes were able to regroup. Captain Infinity then gave Sapphire Bolt and Miranda Miracle the order to warn the other Infinity Force members while he and Crosscheck headed toward the Source computer to stop Touchscreen. Arrowhead, however was standing in their way. Crosscheck engaged the Dark Archer in a ferocious battle as Captain Infinity went ahead. When he arrived at the Mainframe computer he indeed found Touchscreen hacking it. He immediately attacked, but Touchscreen unleashed a series of electrical blasts, forcing him to take cover. The Captain regrouped, drew his sabre and leaped into action, using his shoulder shield to block and absorb the shock attacks. An intense battle ensued but Captain Infinity’s immense power and tactical skill proved to be too much for the technopath. After taking the villain down, Captain Infinity pull up a seat to the computer and began to undo what Touchscreen had done. But CodeName Zero reappeared and ambushed his mortal enemy. Fortunately, the Captain was ready and the two of them clashed in an earth-shattering encounter. Zero’s powers had grown considerably since the last time they fought, rendering them pretty evenly matched. The scales however tipped heavily when Centuria revealed herself. The Captain quickly called for her help, but she did not lend her help to her brother. Instead she teamed up with CodeName Zero! It wasn’t long before the two of them overwhelmed the Defender of The Light. Then with CodeName Zero holding a blade to Captain Infinity’s neck, Centuria helped Touchscreen to his feet then assisted him with completing the hack. Within minutes they had finished and a chain reaction started which cut off power from The Source to Mainframe, and in turn brought darkness to the Infinity Fortress. CodeName Zero laughed with delight and then raised his blade to finish Captain Infinity off once and for all. Fortunately, Mirandle Miracle and Sapphire Bolt showed up and were able to rescue Captain Infinity and escape. The damage, however, had already been done. CodeName Zero congratulated Touchscreen, then he and Centuria prepared for the next phase of their master plan: assimilation.